Names: Pacific Dogwood is also known as Western Flowering Dogwood. It was named after Thomas Nuttall, an English botanist and zoologist. 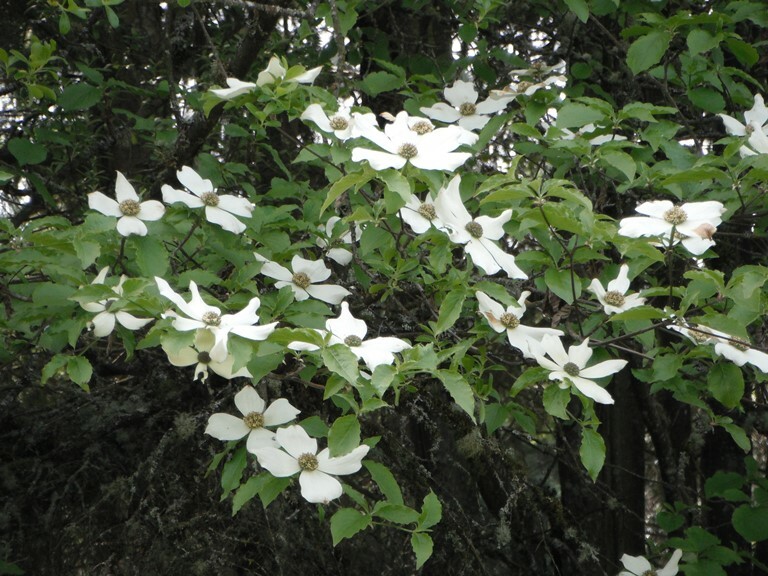 Relationships: There are about 100 dogwood species worldwide found primarily in temperate regions. 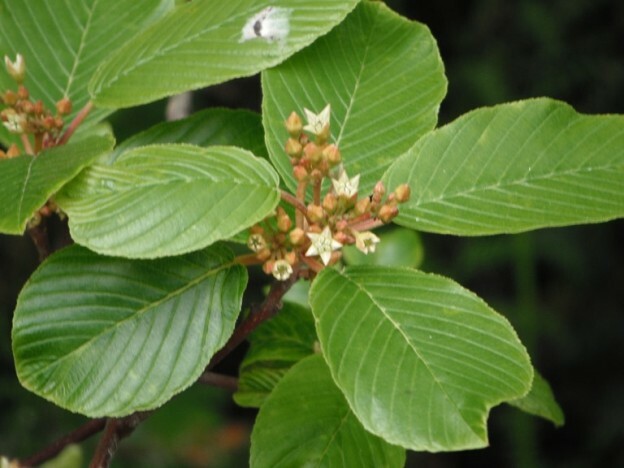 Three Dogwood trees and a couple of shrub species are found in the eastern or Midwestern United States. In our region, besides the Pacific Dogwood, we have a shrub, Red-Twig Dogwood, Cornus sericea, and a groundcover, Bunchberry, Cornus canadensis. 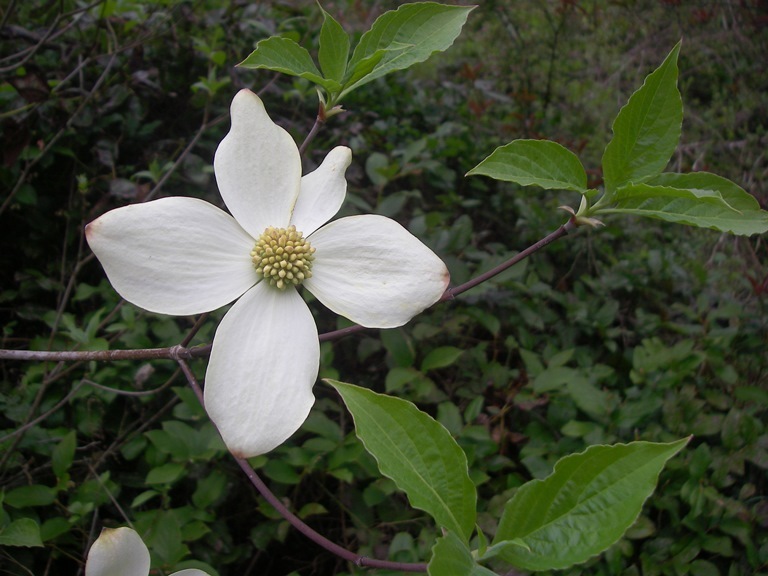 Distribution: Pacific Dogwood is found from southwest British Columbia, western Washington and Oregon and on the west slopes of the Californian mountain ranges. There is also a disjunctive population in northern Idaho. 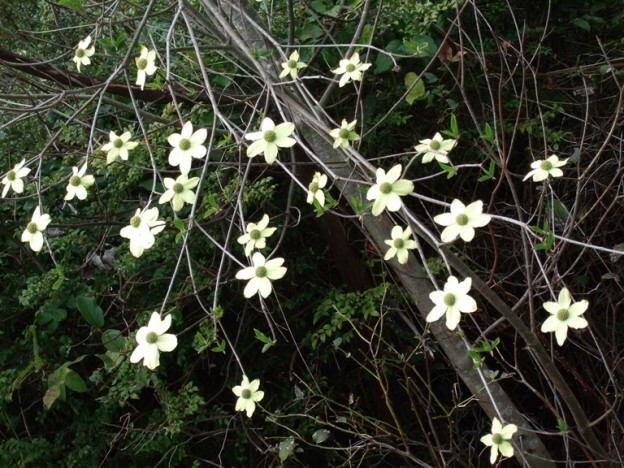 Growth: Pacific Dogwood usually grows to about 20-30 feet (7-10m), but can grow to be 90 feet (30m). It may live to be 150 years old. 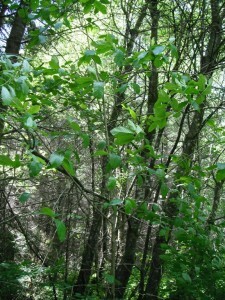 Habitat: Pacific Dogwood prefers moist, well-drained sites and is most often found as an understory tree in fairly open, mixed forests. 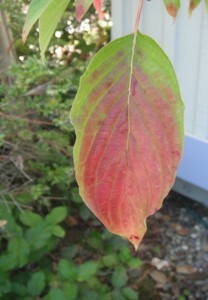 Typical parallel veining pattern of a dogwood leaf, turning red in fall. Diagnostic Characters: The Pacific Dogwood leaves have the veining pattern typical of all dogwoods, where the nearly parallel secondary veins branch from the midvein and curve towards the tip as they near the leaf edge. 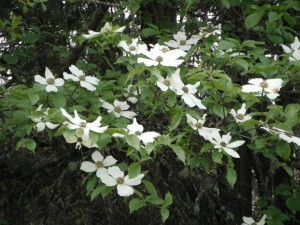 Like most dogwoods, they have opposite leaf arrangement. The tiny, greenish, purple-tinged flowers are pressed into tight hemispheric clusters. These clusters are surrounded by 4-6 white (sometimes pink-tinged) bracts, creating a showy inflorescence with the appearance of one large flower. Each flower cluster develops into a bumpy ball of hard, red fruits in the fall. In the Landscape: This attractive tree is often one of the most sought after native for gardens, but unfortunately larger specimens do not transplant well, and it is sometimes difficult to grow in containers. 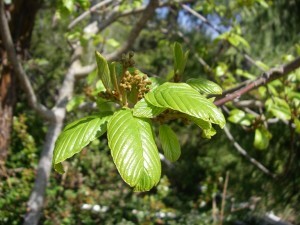 Small trees may sometimes be available in specialty nurseries but they are usually in short supply. 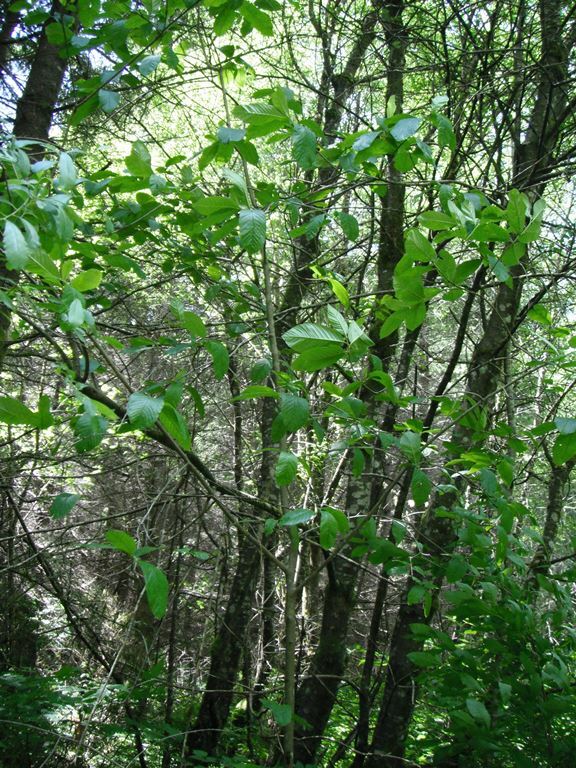 Pacific Dogwood is also very susceptible to a fungus disease called Dogwood Anthracnose. This disease causes large brown blotches on the leaves and will also cause twig dieback. Many people are willing to accept this risk in order to enjoy the spectacular floral display this tree provides in the spring. Tall, flowering, Pacific Dogwood trees are most glorious when they are pressed up against the edge of a Douglas Fir forest. This tree’s beauty continues into other seasons with red berries, pinkish fall foliage, and an attractive branching pattern. Phenology: Bloom Period: April-June, flowering may occur again in late summer. Fruit ripens-September to October. Propagation: Seeds should be collected in fall, removed from their fleshy fruit covering and planted immediately into outdoor seed flats. Germination may take 18 months or more. Scarification and a warm stratification at 60ºF (15ºC) for 60 days followed by a cold stratification at 40ºF (4ºC) for 3-4 months may hasten germination. It is also possible to propagate by layering. Use by People: Natives used the hard, dried wood for harpoon shafts and other implements. The wood has also been used to make thread spindles, golf club heads and piano keys. Use by wildlife: Deer and elk will browse the leaves. Small mammals and birds such as grosbeaks, cedar waxwings, and woodpeckers eat the fruit. It is an impressive sight– Pileated Woodpeckers and Flickers in a Dogwood tree feasting on the berries! 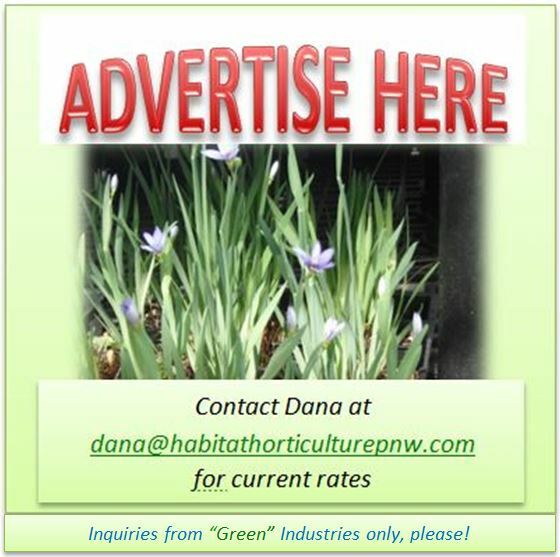 This entry was posted in Broadleaved Trees on April 8, 2015 by habitatdana.